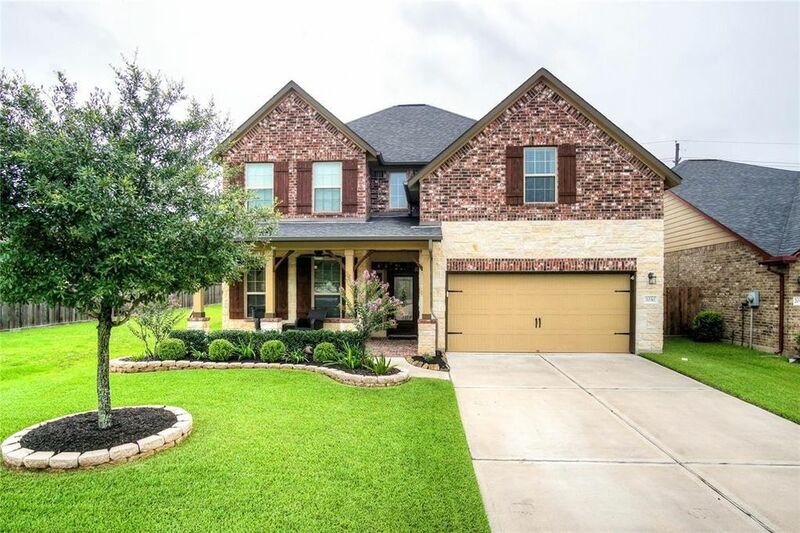 Extraordinary 4 bed 2.5 bath home! Upon entry you are greeted by an elegant formal dining room perfect for all your entertaining needs! After passing through the front entryway you come to a large family room that is pre-wired for surround sound and features hardwood flooring, a cozy tile fronted fireplace, a vaulted ceiling and a wall of windows that shower the room in natural light! Whipping up your favorite recipes is a real pleasure in the beautiful kitchen equipped with granite counters, tile backsplash, under cabinet lighting and lovely wood cabinets that provide ample storage space! Withdraw at the end of the day to the spacious downstairs master suite complete with a luxurious bathroom showcasing dbl sinks in a granite vanity, a walk-in closet, tile floors, a garden soaking tub and a tiled walk-in shower! Upstairs is a massive game room and all 3 secondary bedrooms! The backyard has plenty of green space and a covered patio! Don't miss out on this one! DID NOT FLOOD! Directions: FROM I-69 SOUTH EXIT WILLIAMS WAY BLVD GO WEST. RIGHT ON WILDWOOD PARK. RIGHT ON SUNDANCE VIEW. RIGHT ON MARIPOSA EDGE. CURVES INTO BARON SKY HOME IS ON THE RIGHT.